A few months ago I was introduced to the world of chocolate bars. I was really impressed with Green and Black’s Maya Gold chocolate bar. I remember thinking, how could I use this in my cooking, it might be nice in brownies… This weekend, spurred on by the BrownieBabe of the Month food blogging event, I finally got around to trying. 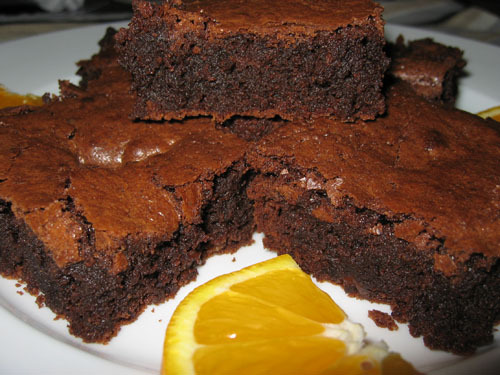 Having never made brownies before, I searched the web for a brownie recipe. I found a recipe for what I would call the “standard” brownie with cocoa recipe but I could not find what looked like a standard for a dark chocolate brownie recipe. The recipes for dark chocolate brownies varied wildly in the amount chocolate. They called for anywhere between 3 ounces and 9 ounces of dark chocolate… In the end, I had 2 bars of Maya Gold so that is what I used. I used the standard brownie with cocoa recipe and replaced the cocoa with the Maya Gold chocolate. I also added some orange zest and juice. I melted one of the chocolate bars and chopped up the other and mixed it in as chunks. The brownies turned out pretty good. I could not resist trying one while they were still cooling and the chunks of chocolate had turned into little pockets of gooey chocolate. Even after they cooled down they were nice and fluffy and literally melted in my mouth. I will be making these again. One unfortunate side effect is that I am now out of Maya Gold chocolate bars and I will have to go and get some more. Melt the butter and the Maya Gold chocolate bar in a sauce pan and remove from heat and let cool. Stir in the sugar, eggs, vanilla, orange juice and orange zest. Mix in the flour, salt, and baking powder. Stir in the chunked Maya Gold chocolate bar. Tip: You can use a toothpick to see when they are done. They are done when a toothpick poked in the middle of the brownies comes out clean. Take a look at the BrownieBabe of the Month roundup at Once Upon a Tart. I ate dem. Dey were good. I don’t know who that other guy is, but I also ate them. Though I agree; they were pretty good. Love Green&Gold's mayan orange bar! Where can I get the green and blacks chocolate? You should be able to find it in the area with the chocolate bars at the grocery store, otherwise any dark chocolate bar will work. Enjoy!